"I don't like it," Ozaukee County Sheriff Maury Straub said Wednesday. "Proponents say it's for citizen safety. As sheriff, I know of very few people who have had to protect their lives or the lives of others by deadly force. How many people who were unarmed do you know of who died when someone attacked them? I don't remember Ozaukee County being that safe. Straub's words could quite easily indicate that he doesn't know of any because those people have not had the right to defend themselves outside of their homes. Also, keep in mind deadly force implied that the goblins got killed instead of just winged. Maybe the Ozaukee residents are good at shooting out kneecaps. "It will give people a lot of false securities. Even though people can shoot at a paper target and take a class to learn gun safety, the bad guys are going to assume their victim has a gun and will be more aggressive and more violent," said [Hartford Police Lt. Tom] Horvath, saying he was speaking only for himself and not the department. What's good for Britain is good for us, hey, loot? Of course, maybe if the goblins feared for their own lives, they'd perhaps think of another line of work. Said Cedarburg Police Chief Tom Frank: "My initial reaction is, I'm not in favor of it because of the many situations in which police officers have contact with angry citizens. "In many of those cases, citizens who have been arrested for various offenses have acted in a violent manner toward a police officer," Frank said. "I'm just fearful that with some people now carrying concealed weapons, the violence toward police officers could become a greater problem," he said. Frank has a valid concern. However, he's weighing the safety of a few citizens (the police) against the majority of the citizens. Police would be safer, too, if they kept the general population sedated. Quick, someone legislate manditory downers for all! Go read Boots and Sabers. Owen's in Milwaukee, so he's got a pony in this fight and he's keeping us up to date. I posted last Saturday about the guy who was selling the Beanie Babies for tools and beer. Well, it's turned into a he-said, she-said, wherein he might have been selling counterfeits. The winning bidder has taken action on Trader List which is apparently some sort of Internet enclave of people who buy and sell a lot of meaningless stuff through the Internet. I wrote the seller, through eBay, using my primary ID, alerting him to the fact that it was rather unlikely that the five hard-to-find beanies would turn out to be genuine and suggesting that he should pull the auction, relist the common ones, and send the others for authentication. Man, what drama unfolds. Counterfeit beanies! Multiple eBay IDs! Cabals of Beanie Believers! The FBI! We all want to be heroes in some sweeping epic, but some people settle for children's books. Dramatic television footage showed Curry, 53, of Simi Valley, trying to hide behind a tree as the man police identified as Strier fired several times. Strier, a heavyset man with graying hair and glasses, calmly walked by stunned reporters before an off-duty sheriff's reserve officer tackled him. The media, defenders of Truth but not, apparently, an individual physically threatened man, filmed and watched this happen without coming to the poor shootee's aid and then let the shooter walk by them before being tackled, not shot, by an off-duty sheriff's reserve officer, someone who was not a full-time law enforcement officer. So keep that in mind, when the media picture the mass of Americans as defenseless sheep, they're projecting. 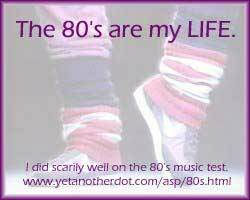 You damn kids playing like you know the 80s when the 80s are as near to you as the damn 60s were to me in the 80s. I'm telling you for the last freaking time, Sade and Slade are DIFFERENT. They're not even pronounced the same. Get offa my lawn before I turn the hose on you! So remember, two pretzels, judiciously applied during consumption of your twelve pack, will prevent you from being a "binge drinker." Please play it. It's not that I want to see it, even for the schadenfraülein; instead, I want the pool of idiots who sign on for these shows to dry up. And nothing will do it better than watching men unknowingly kissing another man. Who would sign up thinking, "I could be that guy!" Come to think of it, it probably wouldn't diminsh the pool of attention starved nutbars who sign up for these things anyway. I take it back. Don't show it and inspire one of the diminishing-returns US networks to pick it up, too. Addendum to my box cutters post: You know all the box cutters found individually on planes throughout the country? Your paranoia shidoshi has a surprisingly simple explanation. Call it Occam's Boxcutter if you will. Is it terrorists doing dry runs to see what they can successfully smuggle? Is it an underground of students out to humiliate the TSA? 9-year-old arrested for waving toy gun. Cop's gun on him. Taken down and cuffed. His mother busted for trying to point out to the cop that it's a toy gun. I assume she's not kidding, and she knows. The St. Louis Post-Dispatch, oddly enough, entitles this story "Small firms will pay piper if big companies get tax break". Stop the O'Learying presses, wouldja? So someone has to make up the difference when the state passes out millions of dollars to Ford, Chrysler, Boeing, or any of the other dozen or so companies that employ a couple of thousand people whenever one of those companies rattles its cup among the various states when contemplating whether to move or not? Lord, love a duck, I know I am an English major, but this sort of thing just seems obvious to me. It's about time a journalist catches up. I don't want to get stuck like those dot com f----ing goons that lost everything because they failed to realize their paper wealth. Diversify from those options, kiddies. Not that I'll have that trouble, of course, since I've put all my money in liquor, canned goods, can openers, and firearms. That's all the portfolio diversification you need. Thank you, gentlemen. I used to use that library you're saving. California Gov. Arnold Schwarzenegger got a warm reception when he presented medals at the 39th annual Mr. Olympia contest. He's huge with the flex-and-pose crowd. "Finally, I feel at home again," he told a crowd of 6,000 in Las Vegas. "This is a terrific sport, and if it wouldn't have been for bodybuilding, I wouldn't have any of this. It's a great foundation." Added Mr. Olympia founder Joe Weider, "Finally it's beginning to dawn on the world that bodybuilders are smart. They develop determination. They don't give up. They don't lose. If they ever apply that to any profession . . . they can be a great success." Gordo, Non Sequitur does not play third line center for the Montreal Canadiens. You cannot even blame Schwarzenegger, or say he hasn't done enough to stop the fires because he's not even office yet. My students, when that fire alarm rings, buzzes, or beeps, you leave the building. Perhaps Ashton Kutcher, wearing a fireman's helmet, will meet you at on the street to tell you you've been punked. But maybe he won't..
Or, if you'd rather not give up cable until you have to, feel free to make Brian J. Noggle the beneficiary of your traveler's insurance as you go (e-mail me for my SSN, which you'll need for the forms). And do not ask your shidoshi about the "coincidence" that he never accepts employment in an office above the fifth floor, nor look in his lower left drawer and seek explanation for the fifty feet of nylon clothesline you might find.